Kira from Oregon! She and I graduated! Kira came to visit again! This time she stayed for 5 days! She must have really missed me, I mean like seriously! Apparently she was graduating. I'm not sure what from but it's rather obvious that she had a graduation gown on so what else would she be doing? I'm just using basic common sense here. I was minding my own business when she noticed me (see photo). She insisted that I be included in her graduation portrait. I'm not a photo whore or anything, but if Kira wants to be in a picture with me then Kira will be in a picture with me. As the reigning Huskercat I was very happy to see her in her Husker shirt and Husker skirt. She has an excellent sense of high-fashion. She just does everything right! I'm still confused about what she was graduating from ... she got college educated a couple years ago and got a fancy art degree. 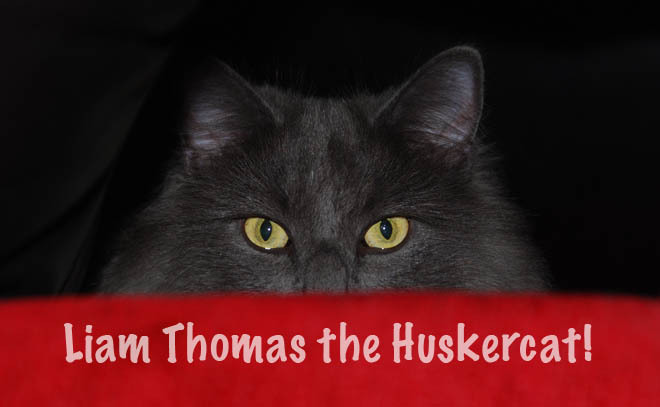 Maybe is was post-graduate study in Huskercatology! I bet that's why she stayed so long. If she did get an advanced degree in Huskercatology I didn't know anything about this degree program. I'm assuming that it would be accredited like fine colleges such as Stanford or Harvard or Chaffey College. Nebraska should be proud to have her sporting her Husker football outfit like this! I wish I was graduating like her. But then what the heck would I do with a higher education. Both my owners have PhDs. It certainly hasn't made them any smarter! HA! !